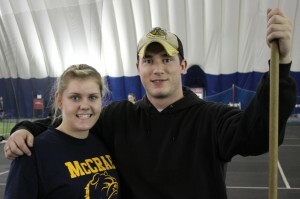 I competitively throw Javelin, Shot Put and Discus for the Ottawa Lions Track and Field Club as well as for John McCrae High School. 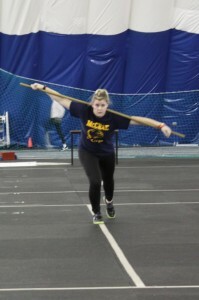 Last year was my first winter and I only trained for javelin but after having so much fun last summer I decided to train for all three events this winter. They are all so different and I like each one for different reasons. 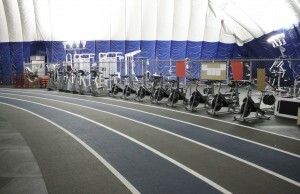 Winter training is done at an indoor dome and the main focus is on strength training and technique. Summer is all about competing 🙂 These events are very seasonal here in Canada. On Mondays, Cory coaches me in shot put and discus. Tuesday nights Bill coaches me in javelin and on Thursdays I either do a combination of all three throws or rotate between the three events depending who is there. I’m lucky that both coaches want to work together to make sure that my training program doesn’t conflict with each other. 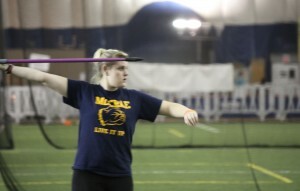 I’m the only thrower with the club that does all three events so I have to balance between them. Each training session is about 2-3 hours long. After the track I go directly to taekwon-do and train there for another couple hours. I’m very excited since there are a few new recruits this winter. It’s good to have lots of throwers since you feed off each other’s energy and we learn from each other but I also love having one-on-one coaching for the fine tuning. 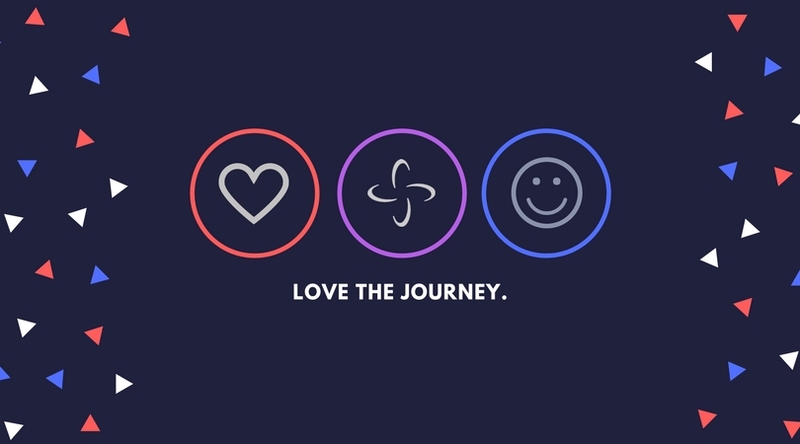 I have my own personal short term and long term goals for each event. Not only do I have measurement distances as my goals, I also have technical goals. I know that if my technical goals are reached then the distances will come soon enough. There is a certain ‘feeling’ I want to reach for each event. 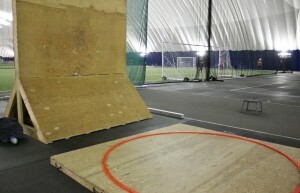 I want to feel more confident as I go up to the throw in competition. That will only come by practice and repetition. Sounds easy right?….. not so much. Throwing is very hard on the entire body! Since each throw is so explosive you can only do so many throws before your body gets exhausted. That is why the conditioning, strength training and using the proper technique is so important. Welcome to my indoor playground! Taekwon-do – 2013 is going to be a huge year for me. I have to place in the the top two at the Taekwon-Do Eastern Canadians in March and also at the Canadian Nationals in May. My main focus will be on my training for the next World Championships in October that will be held in Spain. Being on the National team is a huge honour and commitment not only to the team but to myself. I want to come home with double gold! (patterns and sparring) My TKD training will definitely get more intense as I get closer to competition season. 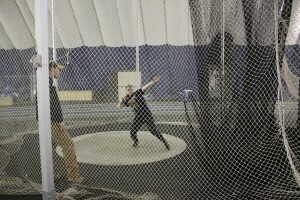 Track – 2013 is also a huge year for throwing for me too. I recently received a letter from a university showing interest about my track results and although I’m only in grade 11 I have to start thinking about it seriously now. I want to do the best I can at OFSAA this Spring as well as during the summer for the Track Club since all my stats will be recorded with Athletics Canada. I also want to keep my honour role status for my school marks to help with scholarships. I’ve decided I want to go into Marketing at university with a minor in Psychology so I need to look at what universities are a good fit.